Occasionally, I post about gardening. 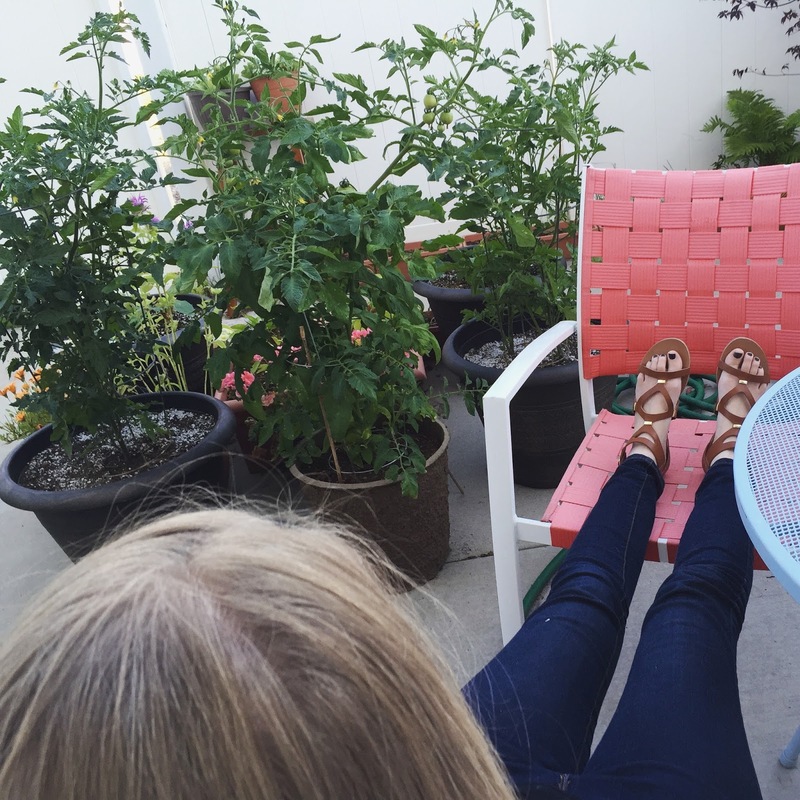 You might be asking yourself, "Why is this girl talking about gardening when this whole blog is about joy?" Good question. Here's why: Gardening is my newfound passion, and, honestly, I've rarely felt this much joy from any hobby of mine. So, there will be garden posts from time to time. This is only my second year gardening, and my first trying zucchini... ever. I don’t claim to be an expert but I have learned one very important lesson that I'm writing about today. This post could also be titled, "Why buying from local greenhouses produces far better results than buying from big box places like Home Depot", or "The Curious Case of The Black Beauty Zucchini Death". Last year, I bought all my veggie plants at a big box store, The Home Depot. This year I attempted the same thing, and bought a few tomato plants, and some Black Beauty Zucchini plants. I’d heard it was a bushing variety and perfect for containers (which is all I can grow plants in because of my current living situation -- read, concrete patio). I picked the healthiest looking plants I could find in the bunch, and planted them in my garden pots. Shortly after that, we started to experience a month of rain, which is very unusual due to the fact that I live in the Intermountain West, and we are a notoriously dry area. The zucchini and tomato plants became sick. The leaves began to yellow and die on the zucchini plants, the blossoms that were forming kept falling off, the tomato leaves yellowed and had black spots all over them. I was sure it was all the heavy rain making the plants get sick. So I tried to dry them out, and eventually had to uproot them, and prepare the pots for new plants. I was given a gift card for my birthday to a local garden center and went to check it out. Their tomato and zucchini starts were so much bigger than the ones at Home Depot. The tomatoes were dark green, and lush. The lady at the center told me to actually plant the zucchini from seed as zucchini hates having its roots disturbed. And there was still time for it to grow and fruit in the season. The garden center also had a lot of heirloom varieties which I didn’t see at Home Depot. So, I purchased a pack of heirloom Black Beauty zucchini seeds by Mountain Valley Seeds, an heirloom Chocolate Cherry tomato, heirloom Black Cherry tomato, and an Early Girl tomato. The tomatoes grow like weeds, and the leaves are plentiful and dark green. The zucchini seeds germinated quickly and sprouted a week later. Every seed planted actually sprouted. I had to clip out most of the seedlings -- it was a painful process. I hate killing a healthy plant. The best part is? The zucchini is growing like crazy. I check it twice a day, and each time I look it’s practically doubled in size. 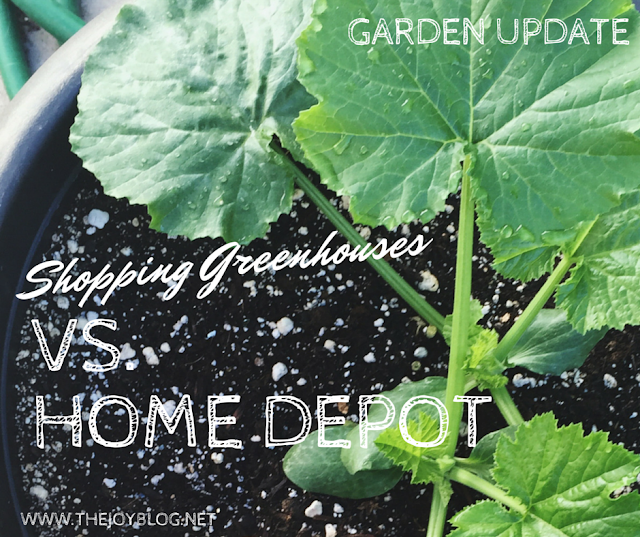 So, the moral of the story is, local greenhouses and garden centers win hands down in a contest against big box stores like Lowes or Home Depot. Look at the difference in the leaf colors! I know the rain contributed to their deaths, but I honestly think the plants were sick before I purchased them. NONE of the tomatoes or zucchini plants at Home Depot looked as deeply green and healthy as the ones from the local greenhouse. The picture on the left is the plant from Home Depot. Also, since the tomatoes were mentioned, here’s a photo of them too. There’s no denying the local greenhouse was a smart change. I'll be shopping local and avoiding Home Depot from now on. If you’re in the Northern Utah County area, Cascade Shadows and Highland Gardens are the places to go! ++ Have you had this problem with big box places?